Alexander Graham Bell's telephone patent, U.S. Number 174,465, from 1876, which has been called the most valuable ever issued (source: USPTO). The modern telephone is the culmination of work done by many individuals, all worthy of recognition for their contributions to the field. Alexander Graham Bell was the first to patent the telephone, an "apparatus for transmitting vocal or other sounds telegraphically" (patent No. 174,465), after experimenting with many primitive sound transmitters and receivers. However, the history of the invention of the telephone is a confusing collection of claims and counterclaims, made no less confusing by the many lawsuits which attempted to resolve the patent claims of several individuals. Alexander Graham Bell of Scotland is commonly credited as the first inventor of the telephone. The classic story of his crying out "Watson, come here! I want to see you!" is a well known part of American history. As Professor of Vocal Physiology at Boston University, Bell was engaged in training teachers in the art of instructing deaf mutes how to speak, and experimented with the Leon Scott phonautograph in recording the vibrations of speech. Bell reasoned by analogy with the mechanical phonautograph that a skin diaphragm would reproduce sounds like the human ear when connected to a vibrating steel or iron reed or hinged armature. 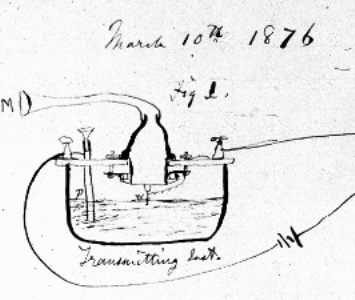 On 1 July 1875, he instructed Watson to build a receiver consisting of a stretched diaphragm or drum of goldbeater's skin (the outer membrane of calf's intestine) with an armature of magnetized iron attached to its middle, and free to vibrate in front of the pole of an electromagnet in circuit with the line. A second membrane-device was built for use as a transmitter. This was the "gallows" phone - because of its resemblance to the wooden construction used for execution by hanging. A few days later they were at each end of the line, which ran from a room in the inventor's house in Boston to the cellar underneath. Bell, in the work room, held one instrument in his hands, while Watson in the cellar listened at the other. Bell spoke into his instrument, “Do you understand what I say?” and Mr. Watson answered “Yes”. However, the voice sounds were not distinct and the armature tended to stick to the electromagnet pole and tear the membrane. On 14 February 1876, Elisha Gray filed a patent caveat* for a telephone on the very same day in 1876 as did Bell's lawyer. 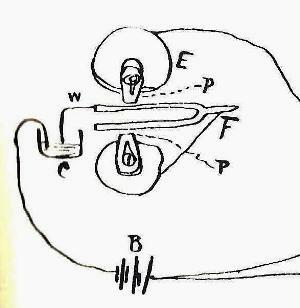 The water transmitter described in Gray's caveat was strikingly similar to Bell's telephone transmitter, a fact which raised questions about whether Bell (who knew of Gray's work) was inspired by Gray's design or vice versa. 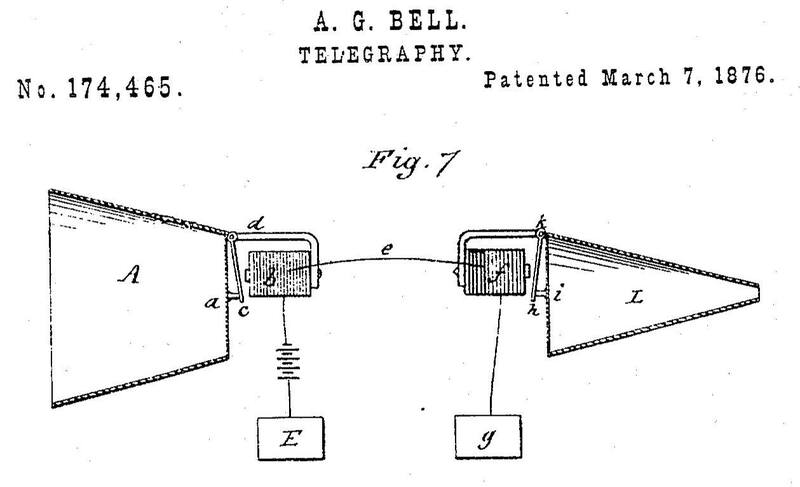 As a rersult Bell was granted the first telephone patent, U.S. Number 174,465, which has been called the most valuable ever issued. * A caveat is an official notice of intention to file a patent application at a later date. It was like a patent application with a description of an invention and drawings, but without claims. The primary objective of a caveat was to prevent the issuing of a rival patent for the same invention to a subsequent inventor. A caveat expired after one year. Caveats were discontinued in 1909. Bell's tuning fork sounder from 1872. Bell's first experiments for improving telegraphy involved a replication and improvement upon on Helmholtz's electrical transmission of musical tones from one vibrating tuning fork to another. Inspired by his work on the harmonic telegraph, Bell theorized in 1876 that if he could somehow vary the resistance in an electrical circuit at the frequency of sound it would cause the current to fluctuate in exact step with the sound. And if he sent that fluctuating current through one of the electromagnetic relays he was using for his telegraph system (the relay functions as a primitive loudspeaker), he should be able to hear the original sound coming from the relay. If he could do that, he believed, he was very close to sending the human voice through that same circuit. He sketched out this idea in his laboratory notebook as shown in the picture below. Basically, the tuning fork layout consists of a few components connected in series: bowl of acidic water / liquid, tuning fork, loudspeaker and a battery. You can easily perform this experiment. Tuning forks can be obtained from music stores. A six-volt battery will do the job. For the acid water use 5% white vinegar straight from the bottle - acidity will increase conductivity of the liquid. The listening device (used in place of Bell’s relay) can be just about anything that can produce sound: an old telephone receiver, a headphone or a loudspeaker from an old radio. Be sure to give the tuning fork a good rap and then quickly lower it to the vinegar, keeping it as parallel as possible to the liquid and ensure that one of its prongs just barely makes contact with the surface of the acid water in order that the the tip of the vibrating tuning fork's prong is being rapidly immersed and withdrawn from the vinegar. This changes the resistance between the fork and the vinegar, which in turn causes the current through the listening device to fluctuate at the same frequency as the fork. Try the experiment again, but with the fork perpendicular to the vinegar; you may not hear any sound because there is no change in resistance. This is a simplified diagram of Bell's liquid transmitter. The diaphragm vibrated with sound waves, coming from the person speaking through the large funnel, just like the tuning fork did, causing a conducting rod (takes the place of the tuning fork) to move up and down in a cup of acid water while the rod is adjusted to just barely make contact with the surface of acid water. As the voice-driven membrane causes the rod to advance and retreat into and out from the liquid, ever so slightly, the circuit resistance will alternately increase and decrease in perfect step with those vocal sounds. And the resulting alternating current with the help of a battery (not shown) will reproduce the original sounds in the receiver (not shown). Bell used a telegraph relay for his receiver but you can use a loud speaker or any other hearing device like in the fork tuning experiment. Although Bell used a water/acid solution as the liquid, vinegar will perform a similar function.